Do you want to explore the world around you and ignite a love for science in the hearts of your students, all without leaving school grounds? Then CSI’s in-school field trips are for you! 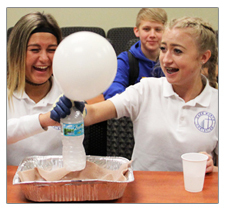 We bring exciting, hands-on science fun to your school, homeschool group and community. Travel back in time by transforming your classroom or meeting area into an engaging exhibit hall filled with Biblical & historical evidences for the creation account as described in Genesis. Discover the effects of the global flood, the ice age, and examples of God's incredible design. Our traveling exhibits include fascinating fossils of creatures that once roamed the earth. 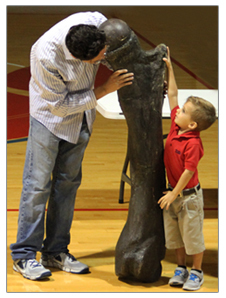 Your students will have the opportunity to touch fossils that were unearthed by CSI on their excursion trips and stand next to one of the largest Columbian Mammoths in the world. But, if touching remains of the past isn’t enough, experience our Ice Age Workshop where students will discover the fascinating creatures of the Ice Age and learn about the climate changes that made them extinct. Each activity will help them to think more critically, to put scientific ideas into perspective, and to learn more about how science works. The programs are developed to encourage the student to become more grounded in their faith and to trust in the inerrant Word of God. Our dynamic teachers will deliver a powerful life-changing message about The Great Ice Age, The World-wide Flood, Fossils and Dinosaurs --all from a creationist perspective. K-12 – Our workshops are tailored to your group’s age/grade. 2-hour Workshop (Presentation + Hands on activity) - $250 (up to 20 students) - $10 for each additional student. For Chapels, Large group presentations – Contact us for special large groups pricing. 1. Fossils and the Worldwide Flood: Learn how ancient fossils from all around the world were formed. Experience how fossils and rocks give testimony of the Genesis Flood and God’s wonderful design from the beginning. Excavate and identify your own fossils through a fun hands on activity. 2. The Ice Age and the Bible: Explore what happened during the Ice Age and learn evidence of how the Ice Age fits into the biblical timeline. Discover the amazing creatures that once lived in Florida, including mammoths, sloths, and megalodon sharks. 3. Dinosaurs and the Bible: Are dinosaurs mentioned in the Bible? Discover these fascinating creatures that once roamed the earth through fossils and replicas. Learn how the diversity in design of this group is a prime example of God’s handiwork. 4. Radical Creatures: Greet, touch & feed some of God's living creatures! Enjoy a fun, educational, hands on presentation where we bring three live animals to your group. Witness their uniquely designed features from a Creation perspective! Bring creation workshops to your classroom. Schedule your in-school field trip today! We serve Broward County area. An additional fee may apply for Palm Beach and Miami Dade areas. THANK YOU FOR CONSIDERING OUR PROGRAMS, BECAUSE ALL PROCEEDS MAKE IT POSSIBLE FOR CREATION STUDIES INSTITUTE TO CONTINUE TO SHARE THE LOVE OF JESUS THROUGH LESSONS ABOUT GOD'S WONDROUS CREATION!